If some of your dining room chairs have arms then you will probably want to check out the Sure Fit Cotton Duck Dining Room Chair With Arms Cover. This is the full length armchair counterpart to the Cotton Duck Short Dining Chair Slipcover that we reviewed here. This dining chair slipcover has a slightly tailored look to it and ties closed. The material is 100% cotton and is made in a plain weave. Like most things cotton, you can machine wash Sure Fit Cotton Duck Dining Room Chair Covers but be sure to tumble dry them on low or they will shrink. Do not use bleach. The covers are available in Sage Green, Bluestone, Linen, Claret (red) and a natural off white. You can find the other colors here. At Simply Seatcovers we have a bias towards short slipcovers that can show off the legs of your dining room furniture but we recognize that our preferred look isn’t for everybody. If you are in that camp then be sure to take a look at this great slipcover. They are currently on sale for less than $10 so be sure to check out this great slipcover for dining room chairs. Keep in mind that like all slipcovers, these are going to slip when people move on them. If your purpose is to update your look then these are a great option but if you want something to protect your chair seats you are much better off with dining chair seat covers than you are with slipcovers. 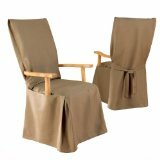 You can see our reviews of the various dining chair seat cover options here. Our editors choice in that category is the SmartSeat Chair Protector. These Cotton Duck slipcovers are meant for decoration not protection. You can read more about the difference between dining chair seat covers and dining chair slipcovers in our buying guide.